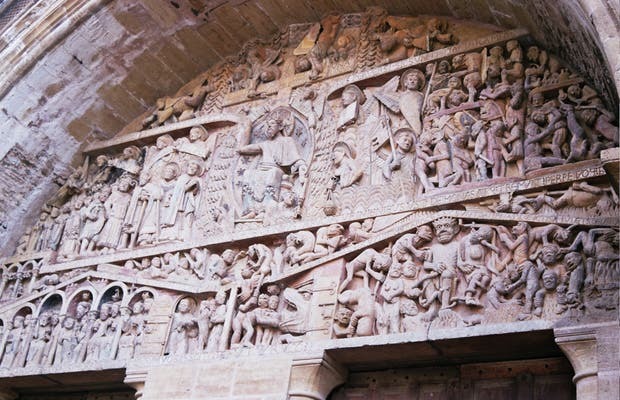 124 characters are in motley representation of the Final Judgment on the lintel of the entrance to the Abbey of Santa Fe. One can spend hours marvelling over the detailed representations of angels, demons, Jesus Christ, the Virgin Mary, the apostles, Paradise, and the Seven Deadly Sins. Key figures in the history of the abbey are also shown, as its founder, Abbot Dadon, one of its principal benefactors, Charlemagne, and Sainte-Foy or Santa Fe, whose relics are preserved in the temple. Some of the figures represented are photographed.